The latest lifeboat to join the fleet of the Royal National Lifeboat Institution, the main sea rescue service in the UK and Ireland, is the waterjet-propelled Shannon class, which the organization says is its most agile and maneuverable all-weather lifeboat yet to be deployed. Designed entirely in-house by RNLI engineers, cutting-edge technology has been used in this new boat to meet modern-day rescue service demands following the lead taken with the RNLI’s introduction of the Shannon’s sister lifeboat class, the Tamar, in 2005.In 2013, the Royal National Lifeboat Institution introduced the Shannon class lifeboat to meet the modern-day demands facing a sea rescue service. The guided-missile destroyer USS Fitzgerald launched from dry dock and is moored pier-side in Mississippi, a step closer to being fully repaired after a 2017 collision that left seven sailors dead, the Navy said.The U.S. Naval Sea Systems Command says the USS Fitzgerald launched out of a dry dock Tuesday at Ingalls Shipbuilding in Pascagoula, Mississippi. The Fitzgerald moored alongside a pier for work that Rear Adm. Jim Downey says will now include testing and outfitting.The ship arrived in Pascagoula on board a heavy lift ship on January 19, 2018, after sustaining extensive damage in a collision with the containership ACX Crystal on June 17, 2017. 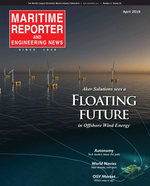 “A new industry is being established in New York, with the primary stimulus being a state-driven procurement process.”New York State Public Service Commission (PSC), July 12, 2018.To a great extent, this PSC comment provides direct insight into the dynamics behind New York’s pace-setting moves to establish offshore wind. First, this new energy development is deliberate – not left to chance or laissez faire markets. Second, state officials are in control, from choosing a contractor to securing money for payment. Third, state utility commissions act on projects. BOATBUILDING: What’s in Your Workboat? Moose Boats rises to the challenge of building its biggest vessel ever. That’s an important step forward for this growing California shipyard. Equally impressive is what’s inside that rapidly developing hull and why those features were chosen.The U.S. boatbuilding scene is a changing landscape of waterfront manufacturing that constantly evolves to meet the inevitable peaks and valleys of demand. Nowhere is that reality more apparent than at California-based Moose Boats. In October 2016, Lind Marine announced the acquisition of Moose Boats.